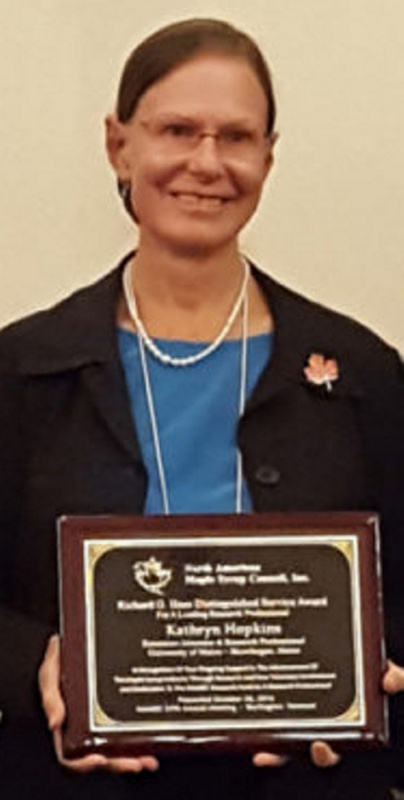 Extension educator earns maple syrup industry award. SKOWHEGAN — University of Maine Cooperative Extension educator Kathryn Hopkins, of Norridgewock, received the 2016 Distinguished Service Award from the North American Maple Syrup Council during its annual meeting Oct. 26-29 in Burlington, Vermont. The award is presented to research professionals or maple research alliance partners for their contributions to the North American maple syrup industry and for their exhibited excellence in the field of research and/or Extension education. Hopkins, an extension educator in agriculture and natural resources primarily in Somerset County, as well as with maple producers statewide, is co-creator of the International Maple Syrup Institute Maple Grading School that has been offered annually for 14 years. More information about maple syrup production is online at extension.umaine.edu/programs/natural-resources/maple-syrup-production.